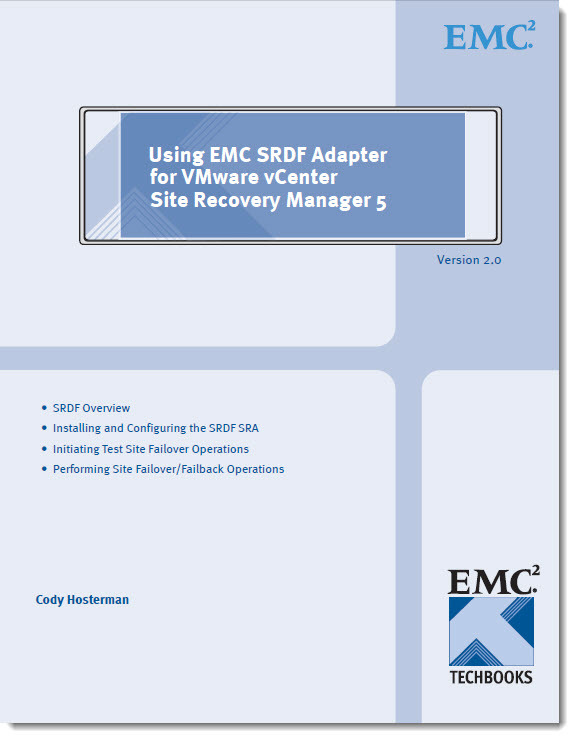 This TechBook (at EMC we formally call these large guides “TechBooks”) goes over all of the information you should need to implement SRDF with SRM. 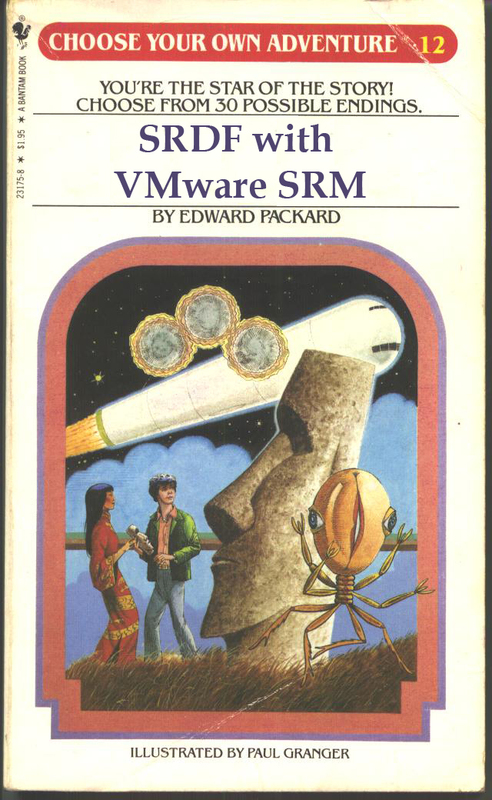 There is a lot of information in it, somewhat of an organized brain dump, so it should be used as a “choose-your-own-adventure” reference, not really meant to be read cover to cover as a lot won’t be relevant for most people. 1. Download VMware vCenter Site Recovery Manager software and release notes from VMware. 2. Download the SRDF SRA (from VMware or EMC), Virtual Storage Integrator Symmetrix SRA Utilities (from EMC) and Solutions Enabler 7.5 or later (from EMC) software and release notes. 3. 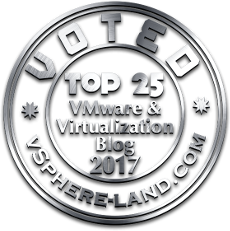 Install VMware vCenter Site Recovery Manager at both sites and pair them with each other. 4. Configure two SYMAPI servers. One in the “protected” site and one in the “recovery site”. Enable the storsrvd (server) daemon and storrdfd (RDF) daemon on both. 5. Install Solutions Enabler 7.5 or higher (32-bit) on both SRM servers. 6. Install the SRDF SRA 5.1 on both SRM servers. 7. Install the Virtual Storage Integrator Symmetrix SRA Utilities 5.4 on both SRM servers. 8. Configure VMware SRM array managers on both SRM servers. Protected SRM server’s array manager should point to the local SYMAPI server as the local server and the remote SYMAPI as the remote. The remote SRM server should be configured in the exact opposite way. 9. Configure the “protected” site VSI to point to the “protected” site SYMAPI server. Configure the “recovery” site VSI to point to the “recovery” site SYMAPI server. 11. Configure SRDF SRA Global Options. 13. Create Protection Groups and Recovery Plans. As always if there are any questions, comments, criticisms of the document let me know! I update this book once or twice a year with the next version of the book slated for Q4. VSI SRA-U 5.4 and SE 7.6 don’t go well with the TF SNAP and TF/VP SNAP test failover config thing in SRA-U. As of now should stick to SRA-U 5.4 and SE 7.5 combination. is there a KB about that ‘don’t go well’ issue with TF Snap ? Daniel the SRA-U is now at 5.6, soon to be 5.7 so Arjun’s comment no longer matters. Simply install the latest version. I see VSI 5.5 is out with SE7.6 support. When will we get update to the VSI SRA Utilities ?